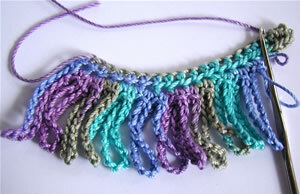 If you are tired of cutting yarn for fringe and love to make chains, this fringe is for you! Use it for a spring scarf or an afghan or even crocheted jewelry. The only thing you need to know is how to chain. Basically, this fringe is just loops of chains attached to the base of your work continuously. 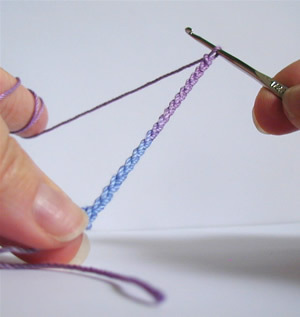 You can adjust the length of the fringe by changing the number of chains in each fringe loop. Note: If you are left handed, just put your mouse over the photo for a left-handed view. 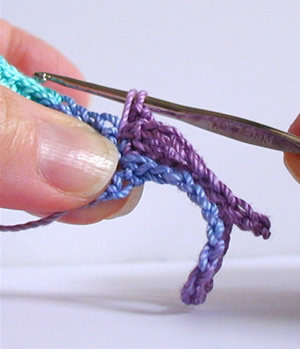 Start with a sample swatch of single or double crochets. 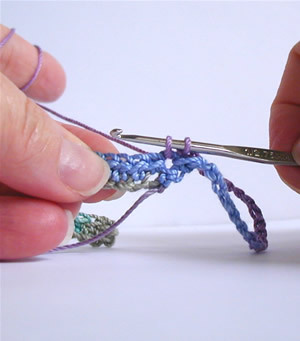 Chain 1, single crochet in first stitch. Chain the desired number of chains for the loop. Here I chained 19. 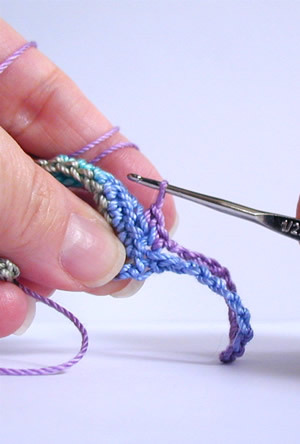 Single crochet in the same stitch as the last single crochet. You have made your first loop! 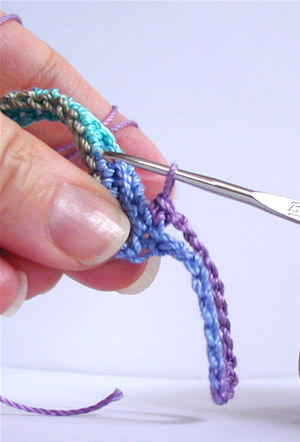 Single crochet in the next stitch. Continue across til the end. You now have a nice continuous fringe without any cutting! This entry was posted on Tuesday, May 3rd, 2011 at 12:00 AM by Robin Beers	and is filed under Tutorials and Help. You can follow any responses to this entry through the RSS 2.0 feed. You can leave a response, or trackback from your own site. I bet this doesn’t tangle the way a standard cut fringe, can. It looks really nice. Maybe I could learn to like fringe if it is made this way! Robin. Simply brilliant. Thank you for this! This is fantastic and so simple once it is broken down! Thanks so much for a great post! I love the yarn you used. Looks shiny and almost metallic. What is it? This is a very handy technique to know. Thank you for posting it! Wow! I love this idea, looks so much neater than cut fringe! Thank you. Deja vu!! Hippy purse & vest from the 70’s. Robin, how smart you are! I have never thought of this. I have shied away from making looped fringes, but not now. Thank you. Thanks so much for this! i will be able to use this on a scarf I am currently crocheting!!! Perfect timing for me! I am getting ready to add hair to my Hindu Goddess Kali doll. I was putting this off since adding one strand at a time is such a chore. I think this will look much better (kinda like dread locks), Making the Goddess Kali look more like a warrior! This is really a marvelous change from the old way of making fringe, thanks! I would however like to know what size needle you would reccomend (sorry can’t find my dictionary) LOL for this new fringe option. 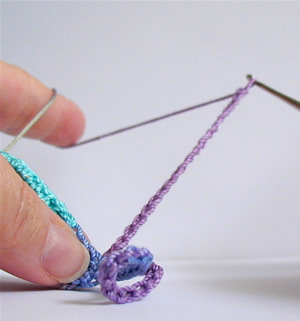 I am practicing with a size H hook, but it could go smaller but I am not sure just how much smaller, is there a rule of thumb when using this technique? As soon as I saw this I pictured a skirt I had in the 70’s. I loved the fringe on the bottom. This could be made as long fringe and added to a skirt that is more up to date. I don’t do fringe because it comes out frayed and ratty looking after washing in the machine.YOU are one BRILLIANT gal….thanks and hugs! This is absolutely brilliant! 🙂 Wish I had thought of it…LOL! Working on some new pillows for my bedroom and this will be an awesome trim. Thank you so much for sharing! This is a fantastic idea. I am definitely going to try this on a scarf that I am currently making. I can see this as a fringe on a pillow or on anything else that needs it. The best part is it wont come off like the cut kind can. Love it !! This is a wonderful idea. You are very creative Rachel! 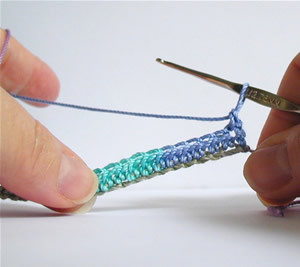 I’m going to use this technique on a crocheted shawl I’m making. Thank you!!! wow! i love this! what a simple way to jazz up just about any project! thank you! Hi Linda, you can do it either way! This is perfect, just what I need to know. Would it work on a knit item? I’m thinking of maybe sc along the entire edge and then going back to do the fringe. Thanks! I should add to my previous comment that I would think care would have to be taken re tension so it is just right, not bunchy or stretchy. Thanks! Hi, found your post on pinterest. thanks for the great tutorial. I am repinning. Almost finished with a triangle shawl made with Vanna’s yarn. I noticed you used a steel hook because of the thin thread. Could I use this fringe with a colored wool worsted yarn by Vanna? Size hook? Thanks for thinking of us lefties! Lovely fringe, thanks for the post. 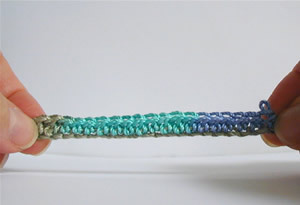 Just a thought while the page is saving, for folks using variegated yarn/thread…using a chainless foundation and making each loop as you go along would coordinate the fringe and base if anyone wanted them to match. 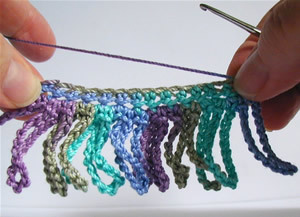 I once made my granddaughter a scarf that was loops like these, but I cannot remember how I did it, it was a long time ago, the loops swirled round and it looked great, I would love to be able to make her another one, any help how to make one would be much appreciated.